At long last I got some action going out in the shed. On Saturday morning my “mate” came and repacked his gear which at least let me start to unpack all our stuff. And finally I got to empty out the back of the truck. The threat of putting everything of his out onto the lawn did the trick – still no sign of any rent but ! As Sunday was such a nice day I got to thinking about a Sunday drive. The best offer I got was from Suzi. So up into the back of the truck she went, I tied her up and then we went for our first drive together – Heno, Suzi and me. Suzi just sat there and behaved herself – Heno didn’t seem any different in the handling or grunt departments. So this week was mainly spent on the tools. Suzi got some driving lights, some decent halogen headlights and a horn that you can actually hear. I’ve pulled the dash apart in Heno in readiness for his major wiring work. Oh, and I finally found the cause of the water leak into Suzi. A mouse has chewed its way through the rubber hose that drains water from the air chamber at the top of the dash. This problem was probably there when I bought Suzi, as we haven’t had her in the rain until a week or so ago. Apologies to my windscreen man – his work was spot on, as always. Just to be sure I’ve put baits in and around Suzi and Heno and also throughout the shed. We have vacant land all around us as we are now living on the edge of town. Last weekend there was a mob of kangaroos in the paddock behind the shed. Twas a tad cold in Moruya this morning – our coldest day so far this year – so I stayed inside and finished the wiring diagram for all the work to be done on the truck. Now that the frost has cleared we have a nice day, so I thought I might have a play with the loading ramps and give Suzi a run as I haven’t been near her since the windscreen was put back in. Surprise, surprise – the drivers side was full of water. The bloke who took the windscreen out and then put it back in after Greg fixed the rust in the surrounds is coming back tomorrow to hopefully fix that. 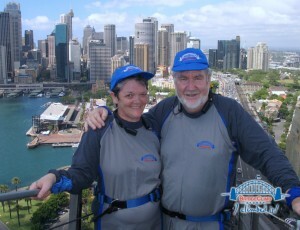 As the photo below shows,the ramps do the job and Suzi climbs up there easily. Now just got to sort all the junk in the back of the truck and start the wiring job. Unfortunately we are off to Melbourne in the morning to attend a funeral and I will take advantage of being down there and call in on my mate to get all the gear needed to do the wiring jobs. The bonus is that mates-rates save 40 to 50%. Hopefully we will be able to get into our garage when we get back. It is currently full to overflowing. Our garage stuff is stacked to the roof in one quarter – the rest is becoming a pain. I did a favour for a mate and let him store his furniture in there but after 6 weeks of nothing happening I have had to get him to find somewhere else. I need to sort through all our stuff to work out what goes with us and what has to be sold. I have sanded off the signwriting on the truck body. Once the weather is a bit more reliable and I can get into the garage (that’s a story all on its own) I will get the sides and back repainted. Congo Trailers (they bought our factory some time back, after renting it off us) fitted a heavy duty towbar to the truck. For additional safety we will be using a 70mm ball and coupling. They are rated to 4.5tonne, even though the van comes in at about 3t. 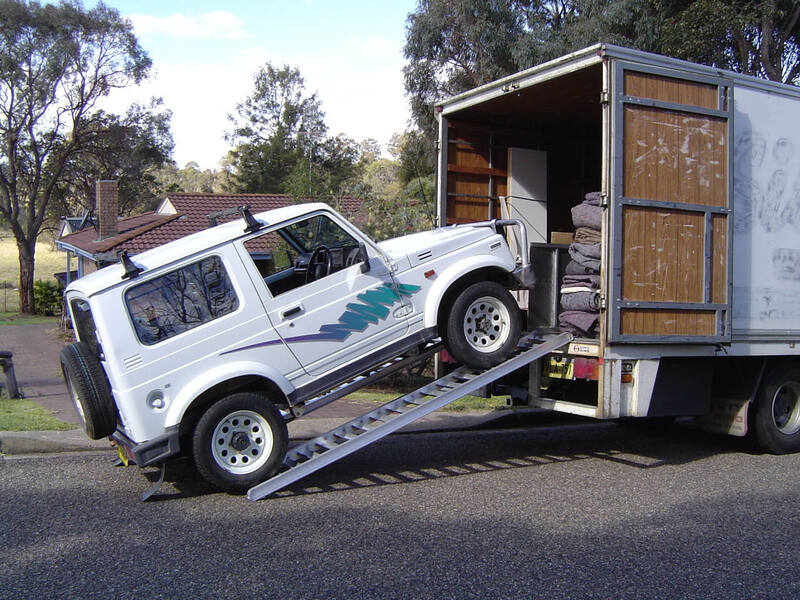 They also manufactured some aluminium loading ramps so the Suzi Sierra we have bought can be easily loaded into the back of the truck. With the truck running on 24 volts and the caravan on 12 volts, I had a few decisions to make on how to get the two working together. The internet, mates and a few phone calls all helped me to sort it all out. Caravan lights are all these new multi-voltage LED lights, so they are OK. Just got to wire up the socket. Into the truck I am adding 2 extra deep-cycle ‘house’ batteries to power a portable fridge and a 60amp 24V to 12V reducer. A dual battery isolator will sit between the start batteries and the house batteries. The reducer will supply 13.8 volts to the caravan and also to the electric brake controller in the truck cabin. I chose GSL gear for the reducer and the dual battery isolator and also bought a 4-stage 240V to 24V/12V volt battery charger from them. This gear could have been either Redarc or GSL. I went with the GSL because it is more advanced – it will automatically cutoff batteries so that I do not flatten the truck start batteries and will disconnect the reducer before the caravan draws too much out of the truck house batteries. Another deciding factor was I could get GSL gear at very good pricing through an old business acquaintance. The GSL 60amp reducer came in well under the best deal I could do on a Redarc 40amp charge equaliser. Just today I got to use the new battery charger, as the truck had flat batteries. Something has gone faulty in the last week or so and is draining the the truck start batteries down quicker than usual. I suspect the alarm system or its reducer is on the blink – just another job on the list. Very impressed with the charger but! I have ordered a Tekonsha P3 Brake controller. That’s another wiring job to be done, once it arrives. Earlier this week I picked up a 820 litre water tank to go in the back of the truck. The 12 volt water pump arrived this morning, it will be powered by the reducer. Thank goodness for the internet when you are a bit isolated from a capital city! I am currently putting together a list of cable, fuses, etc to wire all this up. Doing a job on Suzi. We have owned a few different 4WDs. 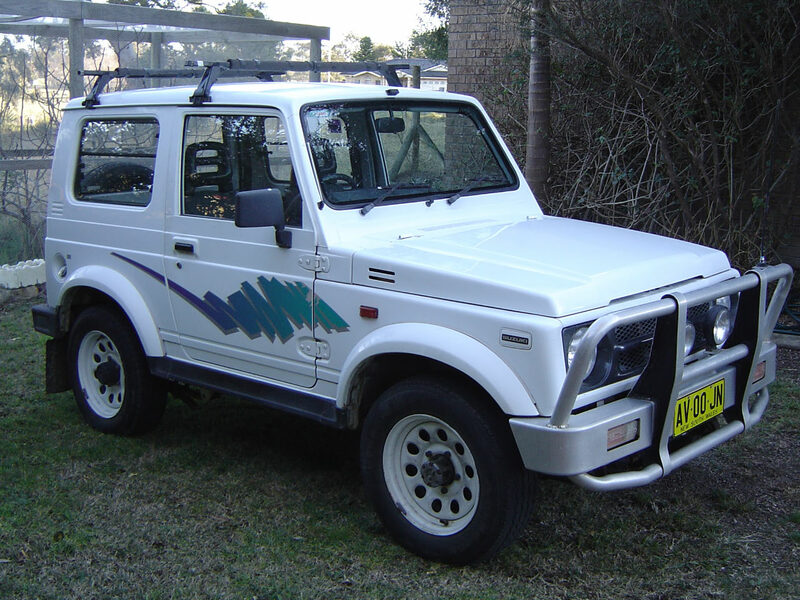 The GU Patrol ute was the best, but I still remember the fun Rod and I had with our first one, a Suzuki Stockman Ute. It was pretty cramped with him and me in the cabin but we did a lot of trips out the back of Moruya in it and it never missed a beat. Space and weight dictated that something about the Suzuki size was on our shopping list. I managed to pick up a 1992 Sierra Hardtop just down the road for the right price. Our Suzi - we look a bit like ma & pa in her, but she'll take us anywhere we want to go ! A mate, Greg C, did a great job of fixing a bit of rust around the windscreen. I would like to put on a snorkel, bigger AT tyres and maybe extractors and do a suspension lift on Suzi. Otherwise she is running fine. At just on 1 tonne the truck won’t even know she’s in the back. What vehicles to go with? We looked at Motorhomes and quickly ruled them out – not affordable in the size we wanted and a pain as you have no vehicle to easily get around with once you arrive at a destination. We learnt that when we, along with Rodney, travelled the north island of NZ in one in Jan 2004. 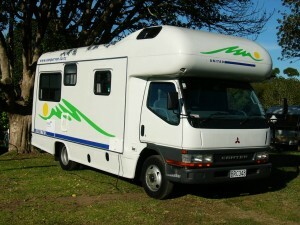 The vehicle we hired in NZ - it was brand new, we were the 1st users. Rear of the mobile home/campervan - with the promise of a magnificent sunset. Next to be reviewed was a fifth wheeler which I liked very much. 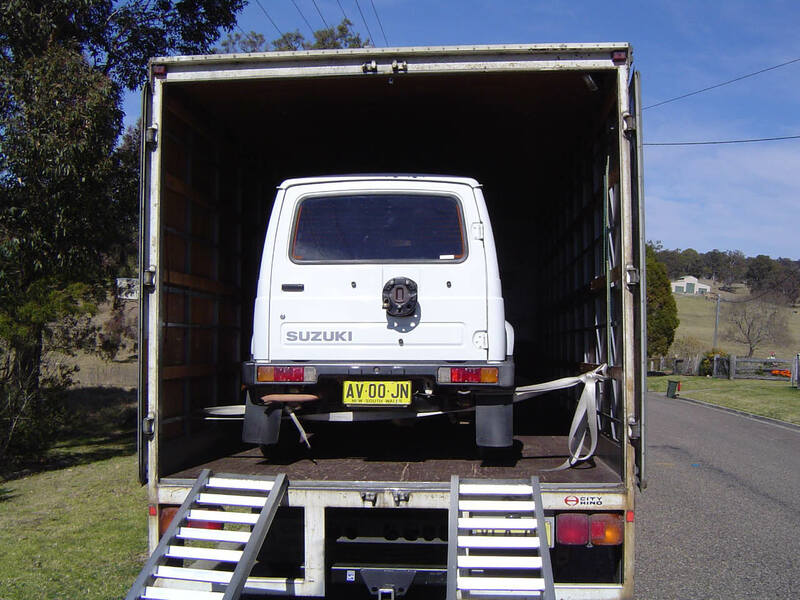 What eventually turned me away from them was the fact much of the load area of the tow vehicle needs to be left clear for the hitch. So we started to research big caravans. This decision was fairly easy from this point. 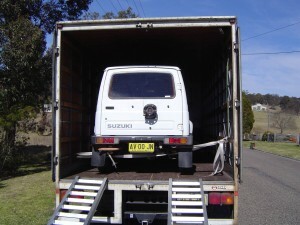 The 1998 Hino FD truck we already owned seemed a logical tow vehicle. It has plenty of grunt (205hp) and is pretty good on fuel – 13.5 miles per gallon, or 4.4km per litre for you Gen X and Y types. It has a 20ft pantech body where lots of goodies could be carried. It is pretty comfortable to travel in, helped by its rear airbag suspension. You get to see a lot more from being perched a bit higher than in a car or 4wd. It is already set up for long distance travel. The truck now has just under 200,000km on the clock and should be good for 500-600K before any major motor work will be called for. We bought it new and I have been the only driver. Hence the truck was chosen as our tow vehicle. 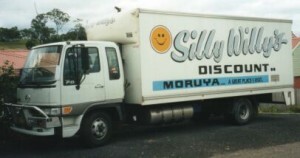 The back end of the Truck, before I took to the signwriting with a sander. 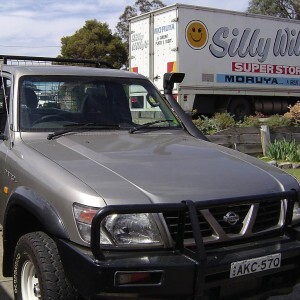 Oh, and a 4WD like the one in the foreground could be handy when traveling around Oz. As the caravan is to be our home for the foreseeable future we both decided it needed to be large. By todays standards, large is anything over 20ft long. 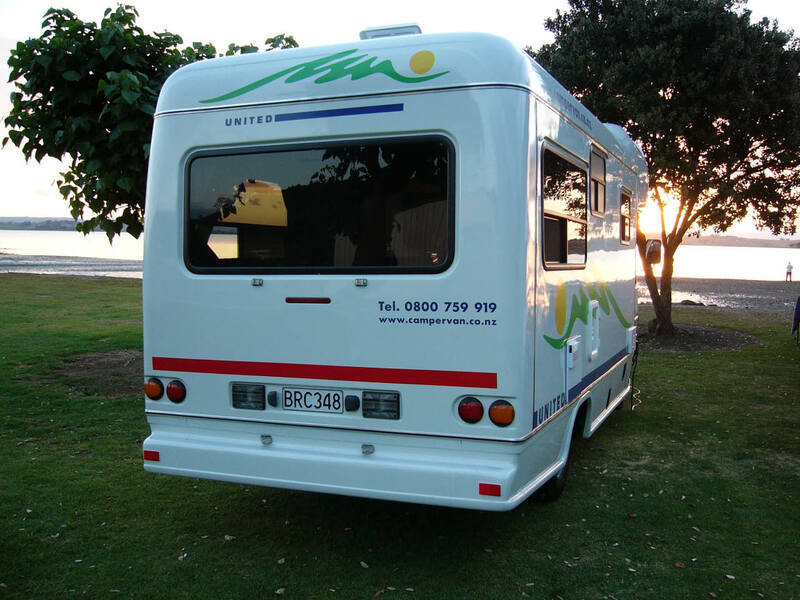 Of the several hundred Australian manufacturers, only a handful make caravans bigger than 23ft. A lot of manufacturers are located in the vicinity of the Ford Factory at Campbellfield, a northern suburb of Melbourne. Co-incidently, that area is where I was picking up a lot of the furniture for our last business venture. After extensive internet searching, talking to caravan and mobile home owners and roaming around three different Caravan and Camping Shows, I shortlisted four manufacturers and then visited their factories. From there the decision was easy. Quality, attention to detail and value for money were the main points that lead us to choose an Aussie Wide Omaroo caravan. We paid a deposit in December 2007. That gave us a place in their production program. Most makers currently quote 4 – 8 months to produce your order. Until we finalised our business and got the house sold we were not game to place a firm order. 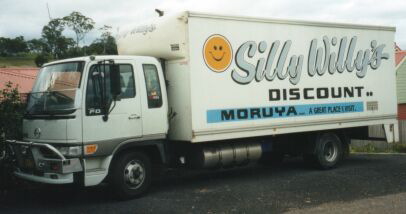 We closed the furniture shop for good on June 22, 2008 and handed the keys back to the landlord a few days later, bringing to an end our 16 years of continuous retail business in Moruya. We first listed the house for sale in October 2007. After lots of lookers, but not one offer, a change of agent in March 2008 produced the result we wanted within a month. The house sale settled on July 1, 2008. We headed to Melbourne the very next day to finalise our caravan layout, chose the materials, colours, options, etc. The deal was completed and ‘our’ Omaroo should be ready mid to late September 2008. We added a few options to suit our intended usage. Swap the 4WD for our truck and you'll get the idea of our setup. So our van will be an Omaroo tri-axle, 25ft x 7ft 9in internal, with all their standard inclusions plus full QS bed (lots of vans claim to have QS beds but they are short of the mark – false advertising ? ), shower, separate toilet, batteries with solar panels, washing machine, satellite TV, reversing cameras (2), 220litre 3way 2dr fridge, split system aircon, etc. A Honda EU20i generator sealed the deal. Through this medium I intend to keep a record of our upcoming trip around Oz. That is, if I can get the hang how it all works. Family, friends and anyone interested can keep track of us. 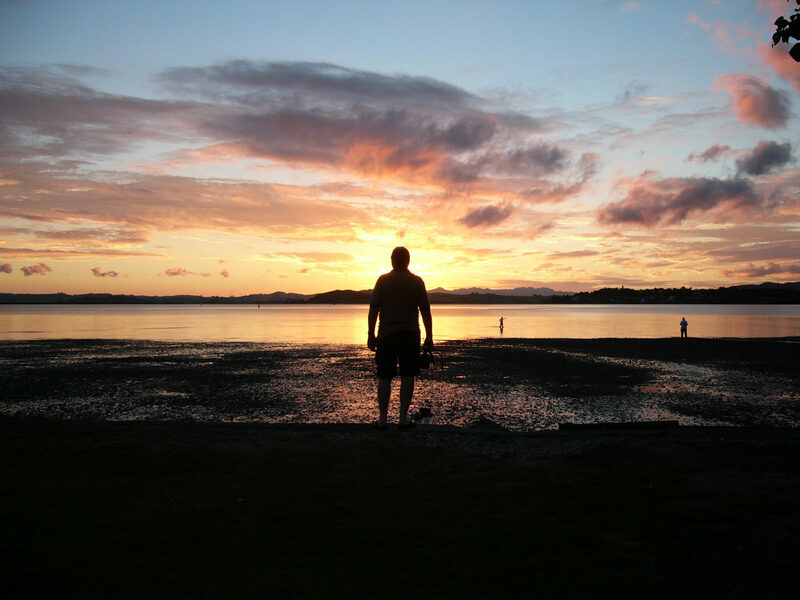 This is intended to be a two-way forum, so please let us know whats going on in your world. I will try hard to write for both of us, as those of you who know Jan will understand that she will be more of a spectator than a participant in this technology.